Miniature: historiated initial 'A' on a bifolium from an Antiphonal on vellum. Leaf: 565 x 400 mm. This historiated initial ‘A’ opens the responsory for the first Sunday of Advent, 'Aspiciens a longe ecce video dei potentiam'. 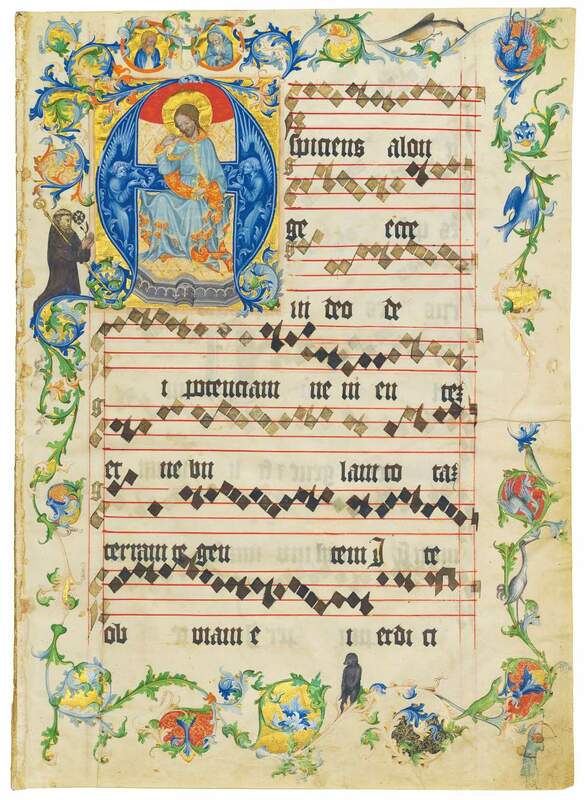 This leaf comes from an Antiphonal made in the early 15th century for an unidentified Benedictine monastery in Bohemia – presumably leaving Bohemia during the 15th century, perhaps during the Hussite wars. Carrying the opening of the first feast of the Antiphonal, this page is illuminated more extensively and more splendidly than any other from the original manuscript and it is certainly the work of the principal illuminator. The exquisite monochrome figures in the initial staves and the full-page border inhabited with birds, beasts, and figures are unique features. This artist is not precisely identifiable but he was clearly within the circle and influence of the illuminators responsible for two of the greatest manuscripts produced for the court of Wenceslas IV: the Master of the Golden Bull (Vienna, ÖNB Cod.sel.388) and the Master of the Bible of Konrad of Vechta (Antwerp, Museum Plantin-Moretus, M 15.1-15.2). This leaf can be placed alongside them as one of the highest achievements of Bohemian court illumination and thus of European art of around 1400.